A good crib is a safe haven for baby for sleeping, resting and playing. Babies sleep from 10 to 14 hours a day making baby crib safety very significant. Your choice of a crib and accessories are among the most important you will make for your child. 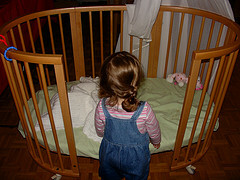 In the United States, The Consumer Product Safety Commission (CPSC) sets standards and evaluates baby crib safety. They have done an outstanding job of eliminating hazards through education and product standards; however, the crib continues to have the highest child injury rates of any nursery item. More than one child dies every week due to incidents involving cribs. Thousands of babies are also injured seriously enough to need treatment in hospital emergency departments, so paying attention to crib safety needs to be a top priority. The CPSC has been actively educating and promoting the practice of “Back to Sleep”. Studies have shown that putting babies to sleep on their backs has significantly reduced the incidence of sudden infant death syndrome, also known as SIDS. This is a devastating outcome for families. Please take every precaution to avoid the risk of SIDS. The Academy of American Pediatrics does not recommend using a sleep positioner, those wedge-shaped pieces of foam that are designed to help babies sleep on their back, saying that they have not been sufficiently tested to show that they are safe or effective. We recommend routinely checking the CPSC recall lists for nursery items and removing recalled products from your home.